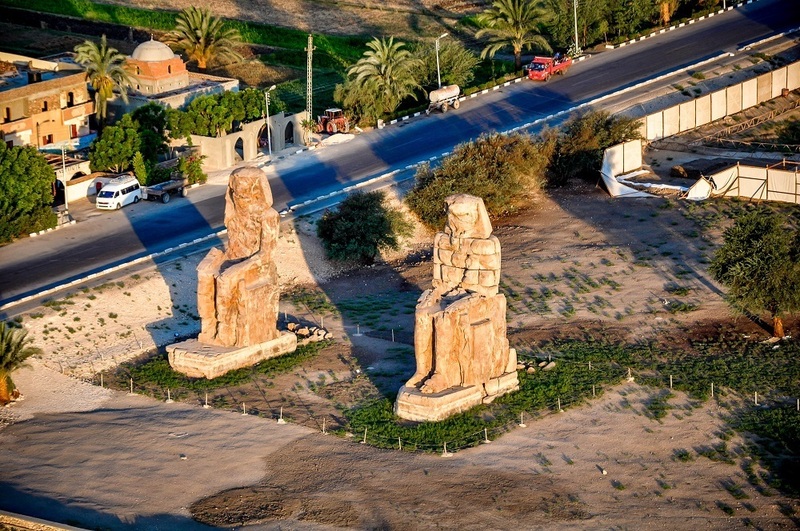 The Colossi of Memnon, also known as Colossus of Memnon, are two massive stone statues on the west bank of the River Nile, opposite the modern city of Luxor, in Egypt. The statues are incredibly tall, about 18 meters high. They represent Pharaoh Amenhotep III, who reigned ancient Egypt some 3,400 years ago. The twin statues depict the pharaoh in a seated position, his hands resting on his knees and his gaze facing eastwards towards the river. They once stood at the entrance gate of Amenhotep's memorial temple, a massive construct built during the pharaoh's lifetime, where he was worshipped as a god-on-earth. When built, the temple complex was the largest and most opulent in Egypt, although very little of the temple remains today. Annual flooding of the Nile gnawed away at its foundations until later pharaohs decided to demolish the entire temple and reuse the stone blocks for other buildings. The statues were spared, although they are badly ruined. There is an interesting legend behind the name of this monument. In 27 BCE, a large earthquake shattered the northern colossus, collapsing it from the waist up and cracking the lower half. After its rupture, the remaining lower half of this statue started to produce a strange musical sound, usually at dawn, probably caused by the rising temperatures and the evaporation of dew playing with the cracks on the statue. Early Greek and Roman tourists who came to hear the sound gave the statue the name of ‘Memnon’. Memnon was a hero of the Trojan War, a King of Ethiopia, who led his armies to Troy's defense but was ultimately slain by Achilles. Memnon was said to be the son of Eos, the goddess of dawn, and after his death, his mother is said to have shed tears —or dew drops— every morning. The “singing” of the statues was attributed to his mother mourning for her son, or perhaps, Memnon singing to his mother? Many early visitors didn’t even know they were statues of a long dead pharaoh. They thought the statues were of Memnon. The earliest written reference to the singing statues comes from the Greek historian and geographer Strabo, who claimed to have heard the sound during a visit in 20 BCE. Strabo said it sounded "like a blow". The second century Greek traveler and geographer Pausanias compared it to "the string of a lyre" breaking. Others described it as the striking of brass or whistling. For more than two centuries the singing statues brought tourists from land far-off, including several Roman Emperors. Many left inscription on the base of the statue reporting whether they had heard the sound or not. About 90 inscriptions are still legible today. Then around 199 CE, Roman Emperor Septimius Severus, repaired the statue and the singing was never heard again. Today, a modern road runs along the ruins of the temple, just a few feet from the edge of Amenhotep III’s statues, demoting this once great pharaoh to a mere roadside attraction.